Azeroth’s need has never been greater—and now more than ever, Speaker Magni Bronzebeard and the titan watcher MOTHER need your help to heal the world’s grievous wounds. In Rise of Azshara, we’re introducing a new system for the Heart of Azeroth that will provide additional power customization options: Essences. You’ll collect these Essences by taking part in a variety of content, and infuse them into the Heart of Azeroth using the new Heart Forge in Silithus, giving you access to new abilities and bonuses. Once you’ve established a new hub in Nazjatar, one of the new areas in Rise of Azshara, you’ll receive a summons from Magni to join him at the Chamber of Heart. There, you’ll learn that MOTHER has completed her calculations related to what's plaguing Azeroth, and determined a way to heal her well ahead of her original 77-cycle estimate. New forms of power have begun to coalesce and manifest around Azeroth’s wounds, and MOTHER has discovered that these “Essences” are compatible with the Heart of Azeroth. To make use of them, she has created a new device in the Chamber of Heart that can harness that incredible power: the Heart Forge. The Heart Forge lets players infuse their Heart of Azeroth with Essences to grant new combat-related powers. Once you’ve collected a new Essence—obtained by participating in a wide variety of content—you’ll head to the Heart Forge to infuse your Heart of Azeroth with it, “learning” the Essence and permanently adding it to your collection. Much like Talents, once you’ve learned an Essence, you’ll be able to apply it or swap it out through a new Heart of Azeroth interface within rest areas, cities, or when using items such as the Tome of Quiet Mind. Each Essence has both Major (generally active) and Minor (passive) abilities. Upon completing the initial quest from Magni, you’ll open a single Major slot in the Heart of Azeroth. Placing an Essence in the Major slot grants you that Essence’s Major active ability, which is added to your Spellbook. You’ll also gain the benefit of any Minor passive abilities from the Essence. 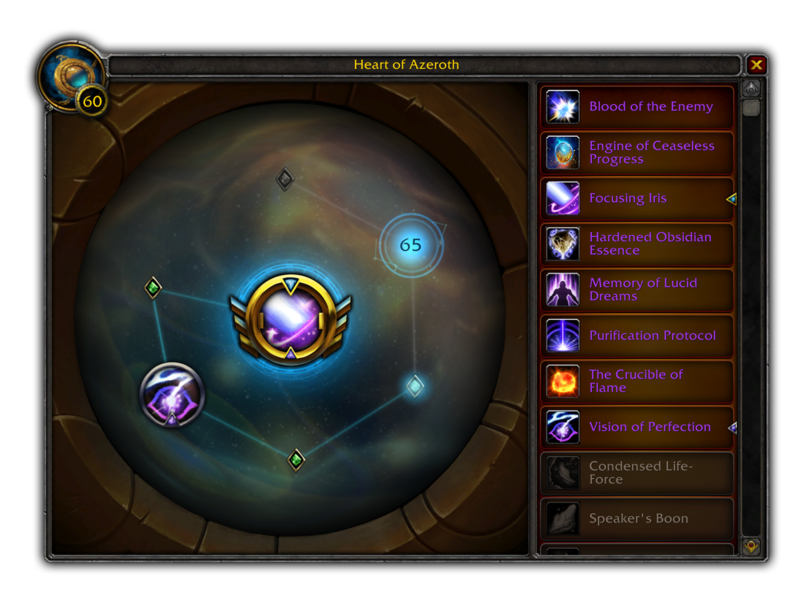 There are also two additional Minor slots in the Heart of Azeroth that will activate the Minor (passive) abilities of any Essences added to them. The first Minor slot will become available at Heart of Azeroth level 55, and the second Minor slot will become available at Heart of Azeroth level 65. Use: Infuse your Heart of Azeroth with Artifice of Time. Create a time vortex around a friendly target that absorbs 496,932 damage and 496,932 healing for 6 seconds. When this expires, the absorbed damage and healing occurs periodically over 10 seconds. Your heals have a very high chance to grant the target 304 Haste for 8 seconds. Use: Infuse your Heart of Azeroth with the Focusing Iris. Focus excess Azerite energy into the Heart of Azeroth, then expel that energy outward, dealing 126, 700 Fire damage to all enemies in front of you over 2.7 seconds. Every 2 seconds, the Heart of Azeroth absorbs nearby latent Azerite energy, increasing your Haste by 29, stacking up to 10 times. Use: Infuse your Heart of Azeroth with Burning Embrace. Draw upon your own vitality to sear your foes, sacrificing 10% of your maximum health to deal Fire damage to all nearby enemies equal to the health lost. Azerite energy courses through your veins, increasing maximum health by 3,430 every 4 seconds, stacking up to 10 times. This effect is lost if you fall below 35% health. Essences are acquired from a variety of content in Battle for Azeroth. 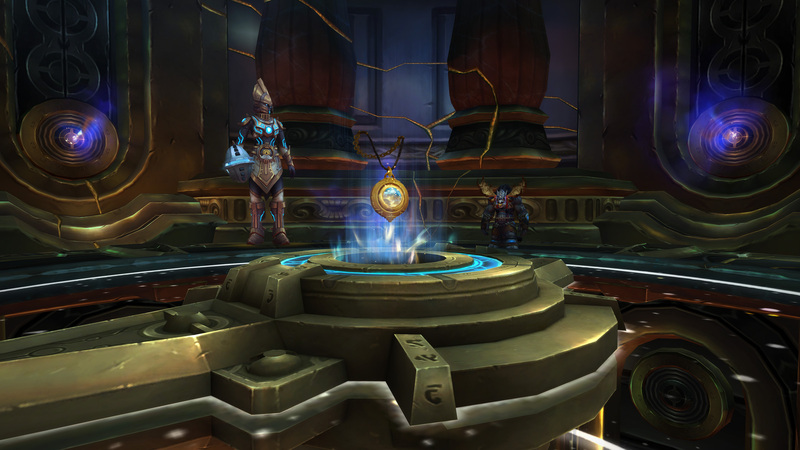 You’ll earn your first one by completing the quest line with Magni, but you’ll be able to earn others through completing specific activities, such as PvP, raids, or World Quests. Each Essence has four ranks that provide new effects. Rank 1 provides a unique ability based on your role (damage dealer, tank, or healer), while rank 2 and rank 3 provide enhancements to both the Essence’s Major and Minor effects. Rank 4 adds a flashier cosmetic effect to the spell, providing a unique visual that will make you stand out from the crowd. Once an Essence is learned, you’ll be able to hover your mouse over the Essence in the user interface to see what you get with the next rank. And because of how Essences are collected, it’s possible to receive and infuse a rank 3 Essence without having learned rank 1 or 2. It’s important to note that while many Essences are role-agnostic, some of these are only usable by a specific role (tank, healer, or damage dealer). Characters who can spec into multiple roles can collect any Essences that are appropriate for those roles, but the system will restrict characters from collecting Essences meant for roles their class can’t fill—for example, a Warrior couldn’t collect a healer Essence. Essences add a whole new layer to the Heart of Azeroth system, in addition to the Azerite Armor that you already have. With all the content coming in Rise of Azshara, there’s are sure to be some new Traits to discover and gear to collect along the way. ← Prev news: New Allied Races and More Now Live!